Phokion Dimitriadis (1894-1977), Greek cartoonist. Isadora Duncan dancing in the street in Athens. Her brother Raymond is seen watching her dance. During that period (1914-16) he was teaching Byzantine music in his school located at Syntagma Square in Athens. Maurice Denis (1870-1943), French painter and engraver, pupil of Gaugin. around 1910. Published in the Parisian magazine L'Art Décoratif, August 1913. 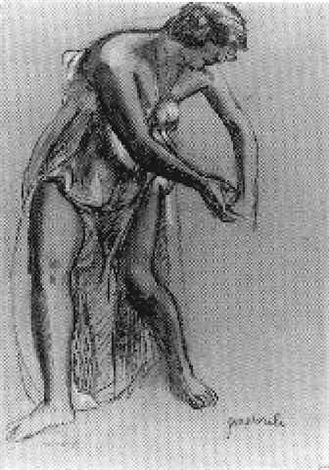 Pastorale (Isadora Duncan), 1912. Chalk, 137.16 x 95.76 cm.